St Luke. Full page miniature. 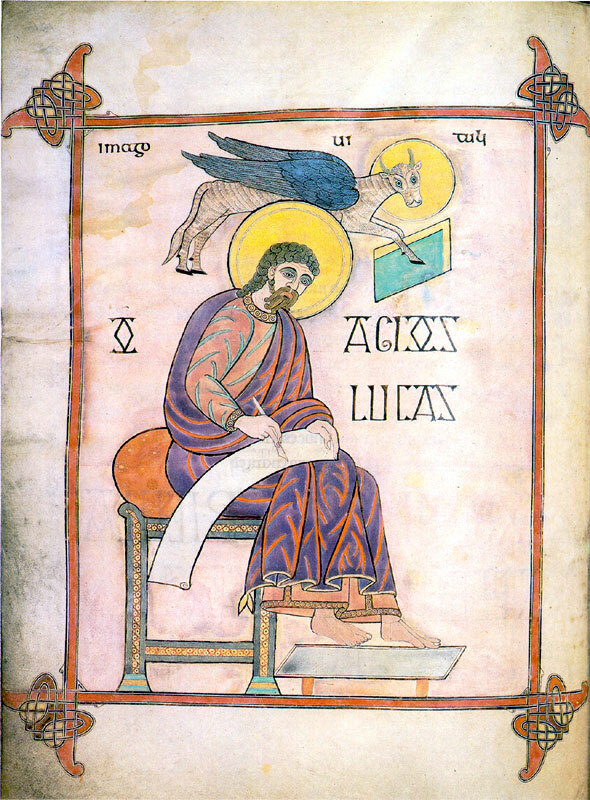 Lindisfarne Gospels, folio 137b. The history of the MS. after its completion deserves a word of mention, for a special romance attaches to it. Written in honour of St. Cuthbert, it was preserved at Lindisfarne along with the Saint's body; but in the year 875 an invasion of the Danes drove the monks to carry away both body and book. For several years they wandered to and fro in northern England; then, in despair, they resolved to cross over to Ireland. But the Saint was angry at being taken from his own land, and a great storm met the boat as it put out; and as the boat lay on its side in the fury of the storm the precious volume was washed overboard and lost. Realising the Saint's displeasure, the monks put back, in a state of much penitence and sorrow for their loss; but at last the Saint encouraged one of them in a dream to search for the book along the shore, and on a day of exceptionally low tide they found it, practically uninjured by its immersion. The story is told by the chronicler Simeon of Durham, writing about 1104; and it need not be dismissed as a mere medieval legend. Precious volumes, according to the Irish practice, were carried in special cases or covers, which might well defend them from much damage from the sea; and it is certain that several pages of this book (which was regularly known in medieval times as "the book of St. Cuthbert which fell into the sea") show to this day the marks of injury from water which has filtered in from without. The subsequent history of the MS. may be briefly told. Always accompanying the Saint's body, it found homes at Chester-le-Street, Durham, and finally at Lindisfarne once more. At the dissolution of the monasteries it was cast abroad into the world and stripped of its jewelled covers; but was rescued by Sir Robert Cotton, and passed with his collection into the British Museum, where it now rests in peace and safety. Picture: 'The Lindisfarne Gospels', Janet Backhouse, the Phaidon Press Ltd, 1981. Lindisfarne Gospels - British Library, Cotton MS Nero D.iv.